← Karaoke is NOT Canceled! 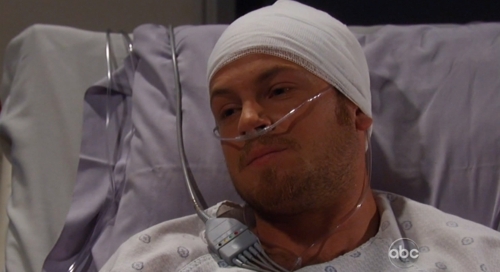 I’m one week into watching General Hospital again after a month’s absence. Having to play catch-up is rather entertaining! For example, I had no idea that Tea’s stillborn son was actually Todd’s nephew in addition to being the child of the man he killed . . . which makes that man his brother, of course. My what a crazy web Todd has woven in Llanview all these years! He’s a fascinating character, much more so than the other Llanview transplants so far. It’s not that I dislike Tea, John, or Starr — okay, I dislike screeching, angry Starr a good deal — but Roger Howarth is so adept at conveying how screwed up Todd is. In almost every scene, I can see Todd laugh at himself for his weaknesses and foolhardy decisions, hate himself for them, and wish he were a stronger person, capable of making better choices. The regret at switching the babies was evident right away, but once he made the decision a second time to keep mum, he did not hold back on it. Calling in a plane for Tea, having her Llanview doctor at the ready to see the baby, and whisking her out of town before anyone can grow the wiser is all the panic of a man who wishes he were that person Tea’s placing her faith in now. Todd knows he is horrible, owns it, and still manages to make me believe that he wishes he weren’t. Sonny stopped feeling bad about who he is years ago, and that’s a big part of why my interest in him has waned. Which brings me to his current love’s woes. I see that Kate and Conni are still utilizing mirrors as an effective means of communication. Kate’s in a hospital — finally — and she thinks she’s responsible for Cole and Hope’s deaths, though I’ve pieced together that Johnny’s actually the person who shot out Anthony’s tires (and then later did kill Anthony, an act I don’t think I can ever hold against him). Letting someone else believe they committed a crime is a soap plot as old as the dirt it cleanses, but Johnny is more fully sucked into that mob life with every choice he makes. Sometimes, I mourn for the wild Johnny we first met who hated that life and tried to divorce himself from it. Will we ever meet that kid again? And will Johnny ever get reacquainted with a razor? These are the questions that plague me. The most interesting thing I’ve gleaned from catching up on Mirror Mayhem Tour 2012 is that Conni packs a mean punch. Doctor Ewan just woke up from her attacking him? Seriously, he’s been out for a month?! I guess I didn’t miss much in the development of his and Liz’s romance, then. I did miss out on some major Mac and Felicia strides, though. How did they get to almost kissing twice in two episodes from barely standing in the same room together? I think that’s the only development I’m sad to have missed from the past month, because I would like to cheer them on again. Felicia has finally realized that she and Frisco aren’t going to be together again, and chasing him around the world is an obsession that needed to be let go of years ago. But I understand why she did it; Frisco and Felicia were my first soap supercouple. But he broke my heart and hers when he flipped that switch a second time back in the early 90s and returned to the WSB. I haven’t forgiven him. Mac, I would forgive anything. I don’t know why he was fired, but he seems to be a lot looser now that he’s free from being Commissioner, loose enough to admit that he still holds a major candle for Felicia. And Kristina Wagner seems a lot looser on screen than she did last time Felicia came back to town. It’s such a shame Georgie never got to see her mom again. If I’m to believe what the characters say, Maxie is willing to let Felicia work her way back into her life, and I couldn’t be happier about that. 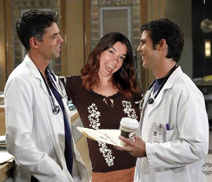 I wish I could be happier about the unplanned wedding of Matt and Maxie. I always thought they were a cute, relatively healthy couple who deserved a chance free of Spinelli’s complications, but . . . times have changed. Apparently, drunk Matt killed Lisa Niles without her attacking him or anything. Maxie admitted he did it to get herself out of jail then married him to avoid having to testify against him. That’s sweet, but I take it she’s also rediscovered her feelings for Spinelli or she wouldn’t have spent her wedding night with tear-stained pillows. Matt’s were also tear-stained from the realization that he can’t go through life without taking responsibility for his crime. I respect that in a soap character, but I’m sad we won’t be seeing much more of the young Dr. Hunter or his relationship with his brother and his niece. He always had so much potential on the show. The final new development I missed is the return of Kristina Corinthos Davis to Port Charles. She has a new face and is showing a lot more of Sonny’s genes. These things happen. She’s also a whiny brat. In other words, not that much about her has actually changed. However, reality TV star is a new look on her, and I can see the Kristina of the past deciding it’s the perfect revenge after finding out that Mommy and Daddy bought her way into Yale. Or is is Harvard? I can’t keep track. Regardless, Kristina is not known for making wise decisions when she’s upset. Plus, it should give Nancy Lee Grahn the chance to flex her comedy muscles, which is always fun. I don’t need to know how that came about to enjoy it. See you in two weeks, when I may have my head wrapped around all these new developments. Or I’ll continue living in ignorance. It really can be more fun that way! Buy my romance novella, Maya’s Vacation, at Astraea Press, Amazon, and Barnes and Nobles. Follow me on Twitter @thegourmez or on Facebook at my author page! This entry was posted in GH Commentary and tagged commentary, conni, corinthos, davis, dr. ewan, general hospital, kate, mac felicia, maggie suicide, matt killed lisa, maxie matt wed, mirror, nancy lee grahn, new kristina, niles, review, split personality, switched babies, the doctor's order, the gourmez, todd manning. Bookmark the permalink.